Savannah and Ben’s wedding is one that I will enjoy seeing photos from for years! I was blessed to be able to attend this black tie wedding and all of the gorgeousness that they brought to Valley View. From the simple, yet stunning floral arrangements to the gigantic open air tent, it really showed off the beauty of Valley View! Talk about dancing the night away by adding a dance floor in the barn that spanned at least half the length, many good times were had by all. Savannah + Ben decided to utilize one of Valley View’s additional ceremony site, make sure you check this out! Kait Winston and Once Like a Spark Photography captured the best moments, please check out their blog below. Link to Once Like a Spark’s blog post by the Photographer Kait Winston. The newly married happy couple! 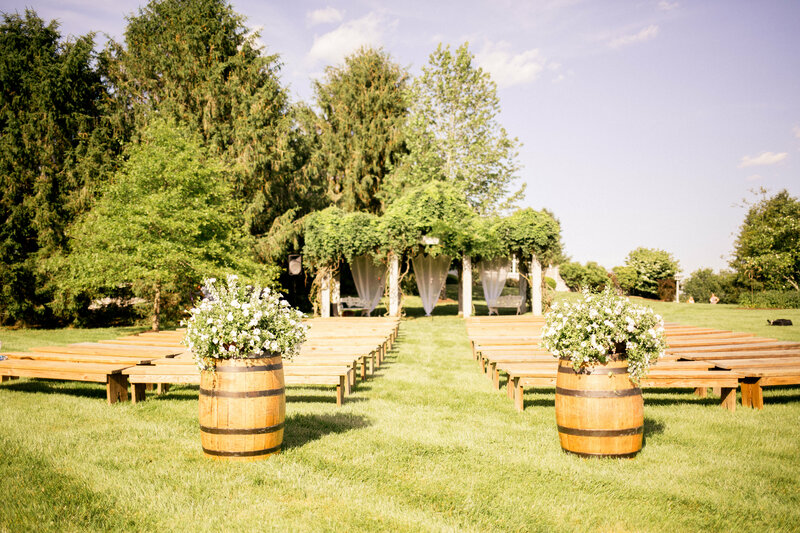 Gillespie’s Floral and Productions is your one stop shop for all of your wedding needs. Look at this amazing tent! The father of the Groom checking out the lobster tails that were prepared by the Chefs at The Greenbrier. The Barn lot just below our big red party barn you will find endless locations that are simply beautiful! The happy new couple enjoying some alone time in the field before the reception began. Savannah and Ben decided to utilize one of the additional ceremony sites at Valley View. This site has a beautiful pergola to be married under or a vast open yard that has the mountain views in backdrop. Savannah and Ben are taking in all of the views from our additional ceremony site, Check out the rolling fields with the mountains in the backdrop. How can you not fall in love with this setting?